Surfing is awesome! There is just no other way to put it! Have you ever wanted to learn how to surf? Well, here is your chance to learn the timeless pursuit of surfing. Steeped in tradition that traces back to the Polynesian People, surfing has evolved into a healthy recreation and sport that remains on the cutting edge. When you enter the world of surfing your very orientation to the world changes. Not only do you have to learn the language of surfing, you have to learn just how to use the power waves to propel you. Regardless of the many differences in size and shape, surfboards are built to enjoy and unlock the power of the waves. Although this guide is by no means an exhaustive look at the world of surfing, it’s a great starting point for beginners that will help you easily master the surfing fundamentals you will need to confidently get you out on the water and in the waves. 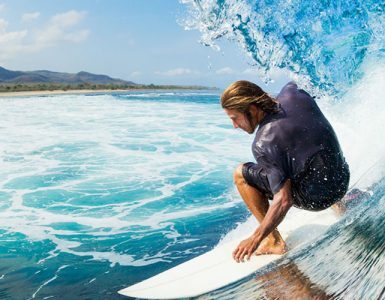 How to Surf: An Introduction to Surfing for Beginners, covers the essentials step-by-step without overwhelming you with intimidating diagrams and lists. It walks you through everything you need to know to become a competent and responsible surfer. Getting out in the waves is easier than you think. We have taken the intimidation out and given you the tools to get out there Surfing on your first day! When you go surfing it is important to know some things about safety. Surfing is very demanding and takes place in an ever-changing, often unpredictable environment. However, with the proper knowledge and experience, surfing can be very safe. To begin with, you should know how to swim well, know how to read the water and make sure to check the weather. Needless to say, on sunny days don’t forget the sunscreen, on cold days don’t forget your cold weather gear. Get into the proper mindset and check your board before heading out. Know a thing or two about water safety and first aid. Just make sure to use common sense. Remember accidents happen when you least expect them. Whether it's for safety or general skill development, an on the water surfing course will provide the information you need for surfing safely and effectively. For example, you will need to know who has the right of way when riding a wave and when paddling out you will need to learn where not to paddle to avoid a surfer’s line. My father used to call it ‘sea puss’. Others will call it simply an undertow. If you are completely new to the ocean, it is important to get a feel for what this is and how to handle it. If you are caught in a current with your surfboard don’t panic. You can swim/ paddle parallel to the beach to get out of it or use it to get out past the waves. You can readily identify these kinds of currents by the darker coloring of the water that is being caused by the churning of the sand beneath or by the surface of the water that may appear choppier due to the incoming and outgoing water flows colliding. As a surfer you are going to be coming into contact with all kinds waves. The bigger the wave, the bigger the forces involved with it. A cubic foot of water weighs 62 pounds, therefore a cubic yard weighs 1684 pounds. Therefore, waves are quite strong! You want to surf to your ability and surf only those waves you are comfortable with. Crumbling waves occur when the bottom has more of a gradual slope. This allows the wave more time to unload its energy, and thus results in a slower, weaker wave. Slower, crumbling waves are ideal for beginners. On the other hand, hollow waves are more fun to surf, but are for the advanced. Hollow waves also break very strongly, and wipeouts are usually more extreme. Hollow waves are formed when the bottom goes from deep to shallow very quickly. Make sure to be reasonable and use a degree of common sense. This doesn’t just mean being prepared with a First Aid Kit and ensuring that your board is in working order, it means knowing your limitations. If you can’t swim, I don’t recommend surfing. If you aren’t in shape, then you may want to start a fitness regimen. If you are new, don’t surf pipeline. Know your limits and everything will fall into place. Surfing is a unique sport and recreation that is steeped in tradition that has a language all to itself. Before getting started, it is important to become familiar with common surfing terminology. A-Frame: A type of wave that breaks both left and right from center. Forms a peaky 'a' shape. Barrel: The breaking motion of a perfect wave; a hollow channel formed inside a good wave when it breaks and curls over. Beach break: A break where the waves break over sandy seabed rather than a reef or rock. Beach breaks generally feature waves breaking across the length of the beach instead of from a single point as with a pointbreak. Breaker: Any wave that breaks on the way to the beach. Crest: The top portion of a wave. Duck dive: A maneuver used to submerge one's board and body underneath an oncoming wave when paddling out to avoid losing momentum and getting pushed back by the wave. Glassy: A smooth water surface condition caused by absence of local winds. Goofy-Foot: Riding a surfboard with the right foot forward. The left foot forward is the more common stance. Lineup: The spot in the water past the breakers where surfers wait or 'line up' to wait for waves. Outside Break: The area farthest from shore where the waves are breaking. Over the Falls: To wipe out, or to get dragged over as the wave breaks. Pointbreak: A pointbreak is formed when water moves towards the beach and breaks on a 'point' such as a rock causing a gradual sweeping sideways peel. Malibu is probably the most famous pointbreak in surfing. Rails: The rounded edges of the surfboard. Shortboard: General term used to describe high performance boards for carving, cutting, turns and airs that are normally between 5-7 feet. Thruster (Tri-fin): A board with three fins set up beneath the tail in a triangle pattern. Allows for higher performance than a traditional single fin setup but can also create more drag. A certain level of physical fitness is necessary to safely enjoy surfing. In addition to being a great swimmer, good physical conditioning may mean the difference between rescuing yourself or needing help, being able to help others and avoiding fatigue that can result in poor decision making and the inability to control your surfboard. Good general fitness, in simple, allows you to enjoy surfing more. The four basic factors that contribute to an appropriate level of fitness are: Strength, Flexibility, Balance and Conditioning. A certain amount of strength is needed to carry the surfboard to the water. Strength is also needed to complete the rigorous paddling that comes into play and the pop ups that get you in standing position. Also, flexibility is a factor in performing of the maneuvers and lessens the likelihood of stiffness. Yet another factor is balance which is essential to surfing. A strong core, agile legs and a lean body ensure that you can balance, stand and maneuver on the board. Lastly, while strength, balance and flexibility enable the surfer to enjoy the sport and perform effectively, endurance is required to maximize your surfing. Better endurance prevents or delays exhaustion that can put a surfer as well as others in the group at risk. Cardio-respiratory fitness is directly related to endurance. In short, the more efficiently oxygenated blood reaches the muscles, the more efficiently they function. This also refers to the ability to exert yourself without straining the heart and tiring quickly. That said, I would highly recommend jogging, swimming, yoga and light weight work to aid in boosting your surfing technique and enjoyment. Arguably one of the most important aspects of surfing is surfing etiquette. As a surfer, you are not alone in the water. You will automatically become part of the gang! As such, I wanted to quickly highlight some of the rules of the road and general etiquette that have evolved with the sport that keep everyone in check, safe and happy. With the growing popularity of surfing, the number of people in the water is on the rise. As a new surfer, you should seek to learn and follow these simple rules of thumb. The surfer closest to the peak or break of the wave has the right of way. In other words, whoever will get the longest ride from the wave has the right of way. If you see a surfer already engaged, you should not drop in on them and get in their way! You should make sure to pull off on your attempt at that wave. Don’t worry your chance will come and there will be another wave with your name on it to take in! When paddling out you should use common sense. Paddle towards the open water where it is less crowded. Usually there are distinct pathways out that you will see other surfers using. Just remember to paddle behind the surfers coming in. Paddle towards the whitewater and not the face of the wave that they are on. This means if you’re paddling out and a wall of whitewater is coming, you don’t have permission to just throw your board away and dive under. Loose boards are a major hazard in the water to yourself and other surfers. Instead, you should turtle roll if you have a long board, or duck dive if you have a shorter board. ‘Snaking’ is when a surfer paddles around another surfer in order position himself to get the right of way for a wave. He is effectively making a big “S” around a fellow surfer. While not immediately hazardous to your health, this is incredibly annoying. You can’t cut the lineup. Patiently wait your turn. Wave hogs don’t get respect in the water. Be a hoot and don’t pollute! The beach and the water together form the sanctuary. Respect it. Pick up after yourself. Also, if you see trash that isn’t yours take care of that too! Look, a new surfer is on a tremendous learning curve and seasoned veterans instinctively know to be wary of you. After all, there is a reason new surfers are referred to as Gremlins! You are bound to make a mistake. It is par for the course. If you were an unexpected drop in or let your board go haphazardly, you can always say sorry. Just try learn from those mistakes and move on.